Greetings from Delhi, where I met up with some current and former Hertie School Master of Public Policy students while in India for a meeting. Six thousand kilometres from Berlin, I found that the Hertie School is making waves in areas ranging from trade standards to healthcare. 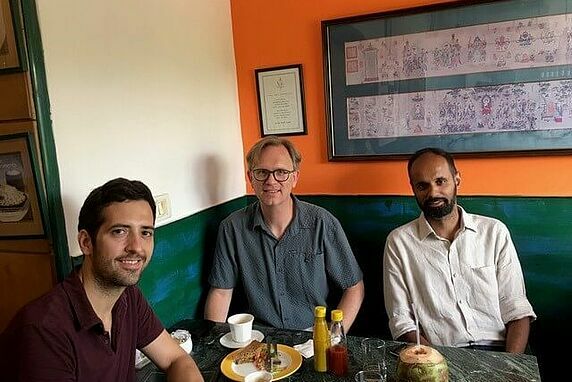 One place that’s happening is CPC Analytics, a consulting firm founded by Hertie School alumnus and current PhD student Sahil Deo and MPP alumnus Christian Franz, with offices in Berlin, Pune, and Strasbourg. The company applies quantitative methods and “big data” to political and economic problems. 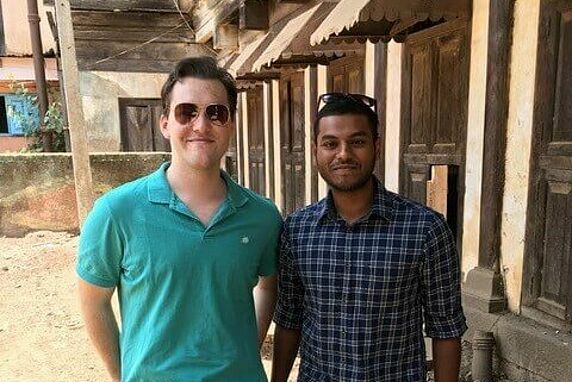 Sahil hired two of our current MPP students for professional years based in Pune – Jonathan Rummel and Rahul Sambathkumar. The three of us spent two hours getting outside the city and checking out some practical governance issues in a few villages. They included the construction of dams and more seemingly mundane topics like the washing of laundry. After a few hours of tramping around, we sat down for some vegetarian Indian food, which included a huge dhosa, an Indian pancake stuffed with vegetables. I also met with alumni Philip Grinsted and Nitij Singh. Philip works for the German development agency GIZ on standard setting in industry, a project sub-contracted from the Federal Ministry of Economics. Common standards should facilitate more trade between Germany and India. Nitij is an independent regional consultant, though he also does some work with CPC Analytics. Delhi is his base and he is finishing a health project in Nepal. CPC’s projects in India include estimating the course of non-performing loans for a few major banks and measuring the use of social media in electoral campaigns. Recently, they tracked how civic engagement is evolving in India via "Twitter Ministries" and conducted a study of 10 randomly selected ministries to assess their engagement styles. The study received national attention in India. CPC has development agency contracts, as well as contracts from several governments (local, state, and national) in India. One can see how the training in methods from the Hertie School has led to tangible jobs, both in the development field and in Berlin and Strasbourg. Of course I didn’t have time to see everyone in Delhi, and there are so many former Hertie School students in India that they are now hoping to start their own alumni group. The Hertie School has 23 graduates who hail from India, some of whom have returned there to work. There is also considerable and growing interest in MPP degrees in the country. A few years ago, Sahil tells me, no Indian university had an MPP programme, and this is one reason he originally came to Berlin. In recent years, several new policy graduate programmes have emerged in India, as public administration has become a “hot” field. I expect to find the Hertie School community growing here in the years to come!